CNN took its time, but it clearly reached a strong decision here. What Martin had tweeted (advocating beatings for men who’d enjoyed the David Beckham underwear ad shown during the Super Bowl plus the same for a New England Patriot clad in a pink suit) was the equivalent of cheerleading for violence against gays. CNN said Wednesday it has suspended political analyst Roland Martin for “regrettable and offensive” Tweets written during the Super Bowl that critics said appeared to call for violence against gays. 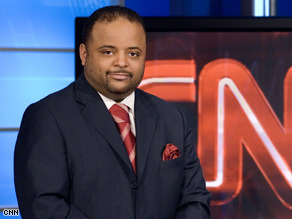 “Roland Martin’s Tweets were regrettable and offensive” – the network said in a statement. “Language that demeans is inconsistent with the values and culture of our organization, and is not tolerated. We have been giving careful consideration to this matter, and Roland will not be appearing on our air for the time being.” The statement did not specify how long Roland would be suspended. “If a dude at your Super Bowl party is hyped about David Beckham’s H&M underwear ad, smack the ish out of him! #superbowl” – one of the Tweets said. “Who the hell was that New England Patriot they just showed in a head to toe pink suit? Oh, he needs a visit from #teamwhipdatass” – said another. Martin initially said he was referring to soccer fans. “I know what I said, why I said it, and it’s consistent with me cracking on soccer. Deal with it” – he said in another Tweet shortly after the first ones. Days after the Super Bowl, Roland Martin has suffered a late hit. The CNN commentator and former Chicago radio host offended gays with a series of Twitter remarks during Sunday’s game, and the news network announced his suspension Wednesday. The remarks provoked protests by the gay and lesbian activist group GLAAD, which said Martin was advocating violence against gays. This entry was posted on Thursday, February 9th, 2012 at 5:31 am	and is filed under Politics. You can follow any responses to this entry through the RSS 2.0 feed. Both comments and pings are currently closed.